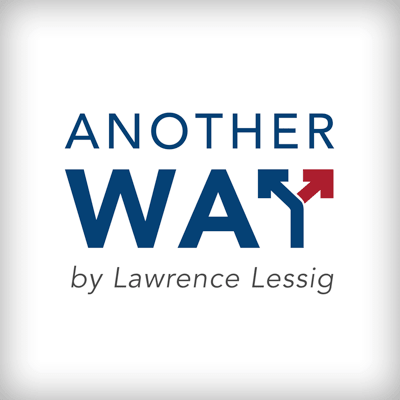 This is Larry Lessig and this is the sixth and final episode of this podcast, Another Way. In the second, I explained why the ways we fixed things in the past just won’t work this time around. In the third, I introduced the first part of a strategy that would work, one involving Congress. In the fourth, I introduced the second part of that strategy, involving a ticket for the presidency that stood above our partisan divide. In the fifth, I described the strategy of such a ticket, one blatantly stolen from the president but turned against his ignorance and betrayal. In this final episode, I do some cleanup, I answer some obvious questions, and then I make a final push. Why should we try to do anything different from what the Democrats have already pressed? Because indeed, and surprisingly, the Democrats have now rallied around an extraordinary package of reform. Barack Obama sketched the elements in his final speech to the nation. Nancy Pelosi has now crafted a package of changes that would indeed remake Washington. Word from the Hill is that she will make a commitment to that package a requirement for members of her caucus, and if she does that then she would be able to say what Hillary Clinton should have said: give us a Democratic Congress and we will give you a government that actually represents you. Now the truth is, I want more than anything to believe that the Democrats would be enough. The business model of electing a partisan Congress is clear, the funding is largely in place, the energy of the Left is as strong as it’s ever been, the partisan energy to defeat Trump in 2020 will be as powerful as any in modern history. Yet a single word convinces me that the partisan strategy just will not work: that word is Obamacare. Obamacare, of course, is an insurance program to radically change access to health care in America. It was an extraordinary accomplishment by a Democratic President and a Democratic Congress without a single Republican vote supporting the plan. Despite the fact that the basic architecture was Republican — Obamacare is essentially MittRomneycare, a plan crafted originally by the right-wing Heritage Foundation — the legislation quickly became a rallying call for the opposition. No doubt many on the Left wanted Obama to go even further but when you count those critics as supporters, which they obviously were compared to the status quo, the plan was wildly popular even among Republicans. That popularity, however, did not matter. The plan became a weapon in a partisan war because such is the nature of normal politics today. Everything is partisan, and anything partisan that finds support enough to be enacted is simply a target for the other side. America doesn’t resolve anything anymore. Anything resolved is just the starting line for the next election’s battle. And so too would it be with “reform.” If the Democrats gain control of Congress and the Presidency, they may well have the votes to pass reform. But if that reform were theirs alone, it would change nothing. Indeed, it would only fuel the movement to resist that reform and thus divide this single dimension of unity within American politics just now. Fundamental reform needs to be more than this. As our history demonstrates, it needs either a party with overwhelming political power or parties that are able to rise above partisan differences and affirm a core commitment to a common core value. We have neither today. The Democrats may well win in 2020. They will not win with a supermajority in both Houses. And regardless of whether they win, if the campaign for control is framed as practically everyone now frames it, the Left taking its revenge by defeating a horrible president and his enablers on the Right, then that win will not inspire cross-partisan unity, it will just fuel the next partisan fight in 2024. Instead, unity must be constructed through parts that don’t live in Washington and that have not grown up on the DNA of partisan division. America the nation is filled with citizens on both the Right and the Left who understand there is difference in America yet celebrate it. It is filled with Americans who realize that democracy means working with people with whom you disagree. There are even some Americans who remember that Ronald Reagan’s greatest successes came when he found common ground with Democrat Tip O’Neil. There are Americans who recognize that the pathology of the current moment is just that: pathology. What we must defeat now is not a party but normal politics. If we’re to have any chance to address the issues that matter, whether health care, or climate change, or a tax policy that could rebuild an American middle class, we must find a way to move beyond this pathology to something that could inspire. For the first time in American history, we have to do this on our own without the exclusive help of one political party on the inside. For the first time in American history, we the People must stand up and do it ourselves. A family sits in its car arguing about where they’ll spend the weekend. The kids want to go to the beach; the mother wants to go hiking in the mountains; the father wants to do both or either or neither, he just wants the bickering to stop. Now imagine the camera pans out a bit, and you notice the car has four flat tires and someone has stolen the battery. The bickering is irrelevant: regardless of any decision, the family is going nowhere. We are that family in that car. We spend endless energy arguing about what we as a nation should do, yet practically no time recognizing and certainly no time addressing what is undeniably obvious to anyone who bothers to look: that we can’t actually do anything, that the vehicle of this democracy has been trashed, and that unless we put aside the arguments long enough to fix the car we won’t be going anywhere. It is not, or not just, the people in office. It is the system they have created. Changing the people without fixing that system won’t change anything. For the next two years, we’re going to watch a horse race as Democrats vie to take on this terrible President. Somehow, we must inspire that fight to become something more. Yes, of course, this President must be defeated but what is the real victory that we should be fighting for beyond that defeat? Because it cannot simply be to win. For if we only win, the frustration that gave us Trump will only grow. A stalemated Democrat will yield to a stalemated Republican. Each administration will, like Trump, simply work to undo the work of the last. So as these Democrats try to become the Democratic nominee, we should remember this: that we had an extraordinary President just three years ago. For eight years he governed as any normal President would. And any of these candidates who would aspire to do no more than that needs to answer a single question: what makes you think you are so much better than Obama? What feature: your chiseled chin, your courage in battle, your billions? What precisely shows us that where he could not succeed, you will? Why do you think you could master the broken system that he could not? We have had great Presidents in the past. This is not enough now. What we need now is a great movement that would give us a government that could actually represent us. That will require a much more fundamental fight. It is a fight that America has waged before and won. It is a fight for self-government, that we must win again. Because if we don’t, we lose. Pick your issue, the refrain is the same: unless we fix this, sensible reform loses. You can tell us you are for single-payer health care but that commitment is not serious unless you have a way to fix this democracy first. You can rally America against climate change but the Congress of the United States will never pass climate change legislation unless we fix this democracy first. Conservatives can rail against the crony capitalists but crony capitalism is our nature and our future unless we find a way to fix this democracy first. Nothing serious will get done until we build a democracy that can do that. I get it. I’ve seen it. I’ve felt this soul-sucking skepticism a million times over. But before you get seduced by the obviousness of the conventional, grab onto a truth that no one can deny: winning is different from governing. We certainly must win in order to govern but the aim of democracy must be to govern. Someday, someone, or at least some of us, must wage that fight and win. If you’re here, maybe that’s you. Or maybe at least you’ll stand up to support that fight. Regardless, thank you for taking the time to listen to this argument. And thank you for the thinking you’ve allowed it to inspire. This is Larry Lessig. With hope.